The Boss RC-30 Loop Station is a feature packed guitar effects pedal offering huge amounts of control over live looping. Ideal for singer-songwriters, you can plug a variety of instruments in to the several inputs, including 1/4" jack and XLR, and get creative with the three hours of on-board memory. Perfect for live performance, the Boss RC-30 gives you two stereo tracks to work with, letting you create full sounding performances when playing live or even helping you along as a great composition tool. Used by many musicians, from guitarists who combine percussive playing with chords to beat boxers who use the built-in effects section for the creation of new sounds, the Boss RC-30 is a hugely versatile loop station. Several connectivity options mean you connect instruments, microphones or an auxiliary input to the pedal and you can even activate phantom power so you can use condenser microphones that require this feature for correct operation. An on-board mixing section gives you the option to change the level of each stereo looping channel independently while the two pedals give you functionality to stop, start and overdub. Please note that even more functionality is available with the Boss FS6 Footswitch. Loops can be imported directly in to the unit from a computer through use of the USB 2.0 port or can be used in reverse, letting you back up the loops you have created for safe keeping. Easily add percussion to your playing and stay in time with the built-in drum loops of the Boss RC-30. Real drum samples have been used to create a variety of loops with different styles and feels for several different genres. You can easily tap the tempo in to the pedal and even set the time signature of the rhythm. As an added bonus, the Boss RC-30 will also save rhythm information to your patches for simple recalling at a later time. Five different effect types are easily activated using one of the RC30's dual footswitches. Choose from Bend Down, a pitch bend effect that lowers the pitch of your loops; Step Phaser, an effective phasing effect that alters your sound in increments; Sweep Filter which uses your current tempo to create a sweeping sound in time with what you're playing; Tempo Delay, which also uses your tempo but this time to create a delay; and finally Lo-Fi, perfect for stripping back your sound to create distinctive and dynamic song sections. Thanks to the variety of inputs and outputs on the Boss RC-30 Loop Station you can simply use it in almost any set-up. 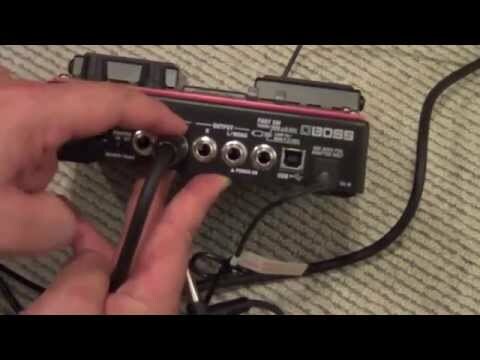 1/4" jack, XLR and 3.5mm inputs are provided alongside 1/4" jack outputs for connection to amps or P.A. gear for easily amplification. Rechargeable Ni-MH batteries cannot be used. Expected battery life under continuous use Alkaline battery (AA, LR6): Approx. 7.5 hours, Carbon-zinc battery (AA, R6): Approx. 1.5 hours, These figures will vary depending on the actual conditions of use. Posted on 21/02/2018 by Lucy I'm a soul/blues singer-songwriter and guitarist and honestly, this thing is a gem. I use it for so many things, from little instrumental interludes/fills to whole extended pieces. It is well made (seriously, it's built like a pack horse), durable and very, very reliable. My muso-type friends have been impressed by the quantizing feature and how easy it is to get it to sound fantastic. I briefly tried another looper (borrowed from a friend, can't remember which model) and it was so difficult to use, but this thing is amazing. I don't use the effects (just personal taste) but when I've had a play around, they are all fantastic (apart from the 'bend down' one, not entirely how much they had had to drink when they thought of that). The only tiny criticism is that it's pretty difficult to change tracks mid-song (unless you pull a Joss Stone and perform with no shoes, and have unusually flexible toes). You can buy a separate footswitch for that though (around £20 I think). Also the cable to use it without using battery power comes separately (another £20 I think) which is kind of frustrating. However, these things are tiny issues that can be resolved by spending more money (as most issues can be), and in no way affect what this product is: a five-star, God-sent piece of kit that will make your gigs so much more interesting and refined. Posted on 26/09/2015 by Liverpool Blues Lover Boss have a very good name and this pedal is no exception. Ideal for the musician who does not want to wait for a drummer to turn up, in fact, it can make you into a one man band. Only ever had one Boss effect need a repair (DD6 broke on me) - cannot wait to add this pedal to the collection. Posted on 31/12/2011 by Swales The Boss RC-30 is a must-have pedal for all types of musician. It is compact, stylish, and a very clever piece of kit. Its quantizing feature is superb for keeping your loops in time and I was also really impressed by the way that the rhythm drum track adjusted itself to the speed of your recorded loop automatically. The dual track feature is also very cool as you can layer as many loops as you want on one track, then do this again on the second and control each track individually and also set the mix between the two. The loop effects are pretty sweet - my personal favourite is the Lo-Fi effect. Saying that, I would have liked to have more loop effects built in but there still are plenty to please everybody. So the Boss RC-30 is fantastic! It's leaps ahead of other loopers on the market (apart from its older brother the Boss RC-300) and if you are serious about live pedals, as many modern musicians are, then this is a MUST HAVE!